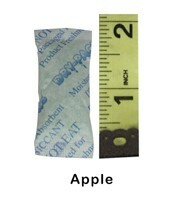 Aroma Dri™ Scented Moisture Absorbing Silica Gel Packet! Utilizing our top of the line Scented Silica Gel packaged inside a Cotton Silica Gel Packet! This fragrant Silica Gel is not reusable or moisture indicating. Perfect to use in bathrooms, under sinks, closets, shoes, etc. to help fight moisture issues while refreshing the area. Purses, Bathrooms, Closets, Dresser Drawers, Gun Case, Ammo Cans, Electronics, Camera Bag, Shoes, Tool Boxes, Cabinets, Drawers, Tackle Boxes, Backpacks, Camping Gear, RV's, Trailers, Storage Bins, Coin Collections, Craft Supplies, etc.